General purpose, high quality cork elastomer jointing. 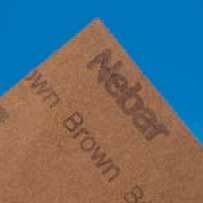 Below 3mm thickness it comprises a predominately nitrile bonded cork; 3mm and above the cork is bonded with a polychloroprene/nitrile blend. Previously designated Nebar® N1. • Extensively used in automotive, engineering and electrical industries. • Suitable for a wide range of flanges. • Retains flexibility down to –20°C (<3mm) or –30°C (>= 3mm). Complies with ASEA 1169 5012E-204; and ASTM F104 line call out — <3mm, F224000M2; 3mm & >3mm, F225000M2.